This video covers the process of replacing a broken choke lever assembly on a Polaris snowmobile or ATV. The choke lever replacement process covered in this video will be the same or similar on many other snowmobiles and ATVs including Arctic Cat, Ski-Doo, Yamaha, Can-Am, Kawasaki, Honda and many more. 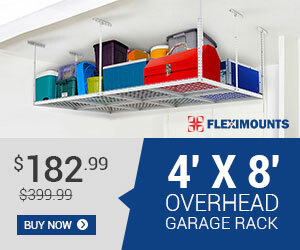 The FLEXIMOUNTS 4ft-by-8ft Overhead Storage Rack is an ideal choice to maximize your storage space. This durable and heavy duty overhead storage system has a capacity of up to 540 lbs. It is made of powder coated steel. The height can be adjusted from 22 to 40 inches providing a convenient and safe place to organize your stuff. This system is simple to set up and all the hardware and instructions needed are included in the package. Fleximounts garage racks come with five different sizes to help you to get the best fit for your garage: 4’x8′; 3’x8′; 4’x6′; 4’x4′; 3’x6′. 1.This garage rack has a big storage space and high weight capacity. You can store large bulky items without any problems. 2. Compared to other garage racks which are offen limited to four vertical posts, our racks come with eight heavy duty vertical posts. 3. Great construction design: The integrated wire grid design and the frame are welded together, making it more sturdy and stable. 4. 75% Pre-assembled. Easy to install. All necessary hardware and instructions are included.